Published on OpenFile.ca on September 8, 2011. Vancouver’s backyard is sprinkled with snow-capped mountains, lush forests, sandy beaches and glittering waters. Drive a few hours outside the neighborhood and you’ll discover dusty deserts, icy ridges and cozy rural towns. In all its vegetative forms, Vancouver and B.C.’s geography has been its calling card for major motion pictures and television series, making it a star on the big screen since the early 1970s. According to BC Film Commissioner Susan Croome, Vancouver’s proximity to Los Angeles, its compatible time zone, temperate climate and, of course,spectacular terrain are what originally drew—and continue to draw—big budget productions to our city. Croome explains that B.C. has 14 biogeoclimatic zones, which is more than Los Angeles, New York or other Canadian provinces. Its diverse geography allows for a variety of films to mold its surroundings to their liking. Some of the more interesting places Vancouver and B.C. have “been” include Mars in Mission To Mars, Singapore in X-Men: The Last Stand, Medieval England in the Girl With The Red Riding Hood, and San Francisco in the latest box office breadwinner, Rise of the Planet of the Apes. This was written by Amanda Ash. Posted on Thursday, September 8, 2011, at 8:51 PM. Filed under Film & TV. 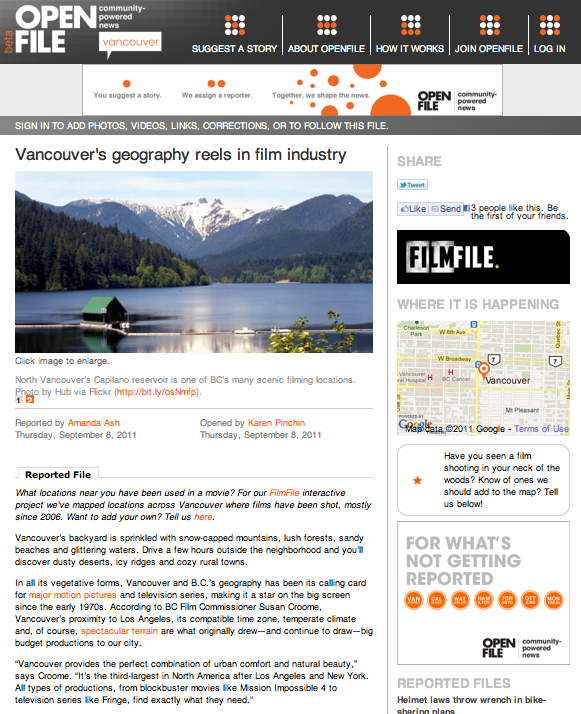 Tagged film, FilmFile, geography, OpenFile, television, Vancouver. Bookmark the permalink. Follow comments here with the RSS feed. Post a comment or leave a trackback.